You tend to associate the term crossover in country music when the sound merges into pop or rock. However surely a far more superior fusion is when an artist blends a little country with a touch of folk and encapsulates it in a coat of acoustic Americana. Before the genre clichés are exhausted, let’s just say that Emily Baker has perfected this art form and is all set to unleash her new album ALL AT SEA on the fortunate connoisseurs of quality music. Recorded in a stripped back manner in the studio of acclaimed producer Gavin Monaghan, the resultant masterpiece oozes with pure roots as Emily’s heartfelt and soul searching songs are brought to life with natural ease. The multi skilled string musician Fiddes Smith has expertly supplemented Emily’s folk influenced vocals with a hint of subtle twang that you would expect from slide guitar, banjo and mandolin. The album is saturated with the influences of Emily’s American experiences, yet combines such expanses with the intimacy of a living room house concert. 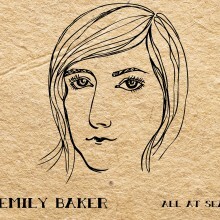 ALL AT SEA, weighing in at a concise nine tracks, is a follow up to Brighton-based Emily’s 2011 release HOUSE OF CARDS and is an album that she felt needed to be made. In an interview with Some of it is True website, she describes it as “Therapeutic? 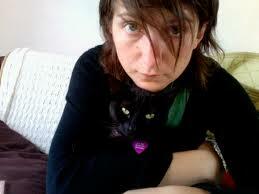 Definitely, they’re a series of songs I had to write to make sense of what was going on in my life”. (link for full interview is available at foot of review) You get the get the feeling of the depth of these songs with repeated listens and each one being a rewarding experience. As far as the tracks are concerned there is only really one to start with. While the song title ‘Tennessee’ might be a little crowded in search engines, the originality of Emily’s beautiful reflective number will ensure this country-flavoured exceptional track can stand proudly against many other established artists basing their song writing material on Music City. Hot on the heels of this track is the snappy number ‘Cold Turkey’ with its references to Kentucky whiskey as well drawing its inspiration while travelling through the bluegrass state. Emily has also mastered the art of taking the sound down a peg or two yet still delivering a knockout chorus. This is in evidence in two early back-to-back songs ‘Best Laid Plans’ and ‘Warm Hands Cold Heart’. One of the admirable qualities of the album is that Emily has gone for quality over quantity with all songs being able to stand on their own merits. The remaining three songs all have endearing features from the gorgeous opener ‘Run’, through the nautical overtures of ‘Coast is Clear’ and ending in the impressive guitar interludes that appear in mellow album closer ‘Out of Time’. All in all this is an exceptional collection of songs that give you a brief glimpse of acoustic heaven. So enough of the superlatives, the message is out. Get to know the music of Emily Baker and treat yourself to a fine exposure of country-folk-Americana crossover.